Sort through disorder by using key pieces that lend themselves to a polished look. Choose well and these pieces will offer elegant functionality so that your home not only looks tidy, but also rather stylish. The start of the new year is an ideal time to get rid of the jumble of things that tend to pile up. Not only does it offer you the opportunity to clean up a bit, it also gives you a chance to curate a look you might not otherwise be able to achieve. Clever containers such as baskets, bookcases and cupboards are good tools to help you in the sorting and assigning process. ​When you’re tight on space, it’s a good idea to invest in dual-purpose furniture that can act as storage as well as another functional furniture item. The Wenzel coffee table that’s also a storage chest for books or throws is exactly the sort of piece we have in mind. If you’re known to toss your clothing items, such as a jacket, to one side only to regret the creases when you’d like to wear it again, then it’s time you got yourself a dumb valet. It’s tidier in every respect, looks great in your bedroom or walk-in closet and will lead to far less wardrobe meltdowns in the future. An open bookshelf is a good piece to use to display both books and other small décor items, making sure that every item in a room has its place. We’re partial to our Darston bookshelf for its modern look and feel. For smart space use, consider an open bookcase such as our English Countryside Utility bookcase in our Made by Sibley collection, with its adjustable shelving system, making it customisable to your own requirements, be it to serve as a TV unit or simply as a place to store books and trinkets. 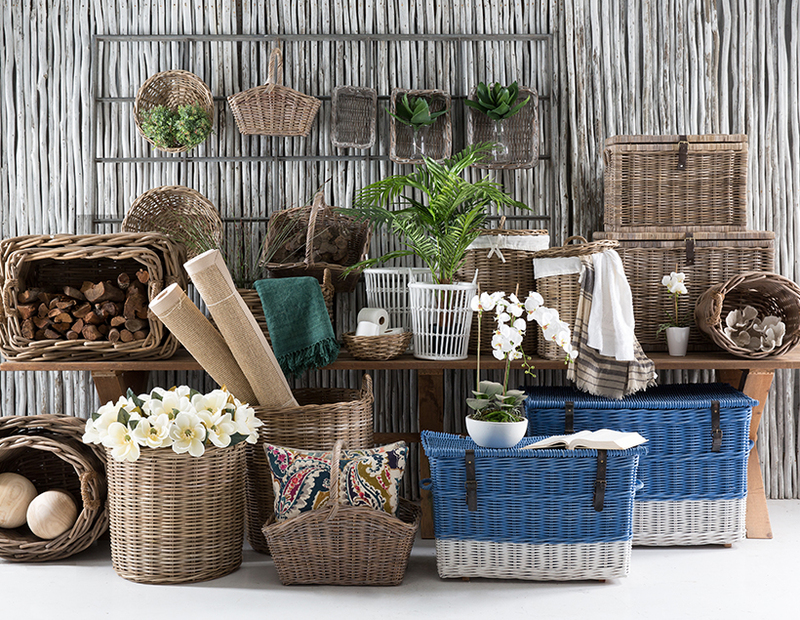 For those items that seem to pile up on their own, there’s nothing simpler and as effortless as a basket. Toss blankets, cushions, books or toys into an open basket in the family room, or for a tidier option, choose a basket with a lid and leather straps such as the Koste Kubu Rattan basket. Organise your hobby or office once and for all by installing the English Countryside workstation. This Made by Block & Chisel piece can be drawn up to your particular specifications, ensuring it is made to fit exactly, while offering a one-stop storage solution with a variety of drawers and shelves, as well as desk space to ensure you get right to work.